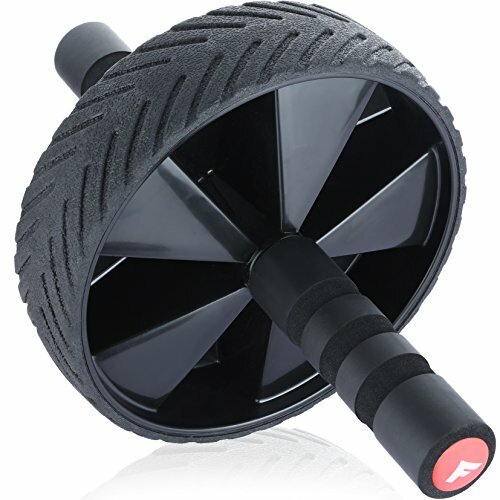 Fitnessery Ab Wheel - Add To Cart NOW To Enjoy This Ab Fitness Equipment In 48 Hours With Amazon Prime! With this fitness ab equipment for abs, building a set of abs of steel just became a whole lot easier. Convenient and easy-to-use. It strengthens your core, burns calories and tones your abdominal. The wheel features non-slip rubber and grips any floor surface. The ab wheel is made of stainless steel to ensure long-lasting durability. And features padded handles for a comfortable grip. Each purchase includes a knee pad and 2 bonus E-books. The E-books are emailed to you after purchase. ✔ Every purchase includes 3 FREE bonuses gifts that you won't find anywhere else! Fitnessery Ab Wheel Ships Super Quick - Get Started 48 Hours From Now With Amazon Prime. All Fitnessery Products Come With Life-Time 100% Money-Back Guarantee. If You Have Any Problems With This Ab Wheel Gym Equipment, Simply Ask For A Refund Or Replacement. No Questions Asked. ▸ Ultimate Abs Work Out E-book: contains 45 pages of recommended abdominal exercise and home exercises that you can try straight away. Learn the 5 little known secrets to effectively work out your abdominal muscles. You will receive this E-book via email. ▸ Six Pack Abs Nutrition E-book: packed with 90 pages of information rich content on which fad diets to avoid, eating healthy and balanced. Learn how meal frequency, metabolism and the thermic effect of foods can help you get a set of abs. You will receive this E-book via email. ★ SCULPT YOUR ABS: Fitnessery ab wheel acts as your personal fitness trainer - helping you to build stronger and bigger six pack abs, burn calories, build muscle and improve your overall endurance. Your ab wheel comes with 3 free bonus gifts and life-time money back guarantee. Add to cart NOW to enjoy this abs cruncher in 48 hours with Amazon Prime.